allows us to enjoy a different time in the company of friends, your partner or family. Make tourism in Venezuela, it has become a hobby for many people, because we have different options for fun in different tourist spots. The Gran Sabana is one of the biggest tourist attractions in the country, and an awesome place that you'll love when you visit, its landscapes impress you and live an incredible and unique experience especially if you know the Angel declared a World Heritage Site by Unesco in 1994. We are facing a real German colony outside Germany, located in the cooler mountains of Aragua state. This place is just two hours from the capital city, today it is one of the most visited tourist towns. It is considered the perfect place to share with family or as a couple. 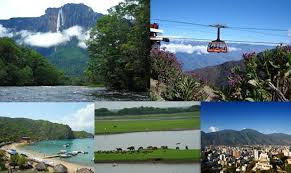 It is one of the most popular places in Venezuela, because it has many attractions and an important hotel infrastructure. This port has some beautiful beaches to visit them stay only causes them. This beautiful resort is located in Sucre state via Casanay, it is a spa mineral waters with a large area and a variety of pools and waterfalls. Morrocoy has delightful beaches, unique natural landscapes, islands, private beaches and beautiful islands called cays Borracho, Pelon, Sombrero, Sal, Playuela and Peraza. It was declared a national park on May 26, 1974. The archipelago of Los Roques is known worldwide. Here we find spectacular scenery and its calm waters, fine sand allows us to enjoy a wonderful atmosphere. Today is one of the main tourist attractions of the country.